According to the report of HRANA, Dr. Ismail Afkhami, who had been detained in Ardabil about a month ago, was released on the bail of 3 billion IRR from Tabriz Central Prison on June 8, 2016. Also Mr. Yones Rahimi, was released a few days ago though the condition for his freedom is unknown. There is no information about situation of the other detainees of the above-mentioned activists. Approximately a month ago, six Iranian Turk activist had been arrested in Ardabil, northwest Iran.The place to which they had been transferred was totally unknown until Habib Sasanian could ring his family informing that he was being kept at the custody of Iranian Intelligence Service in Tabriz. 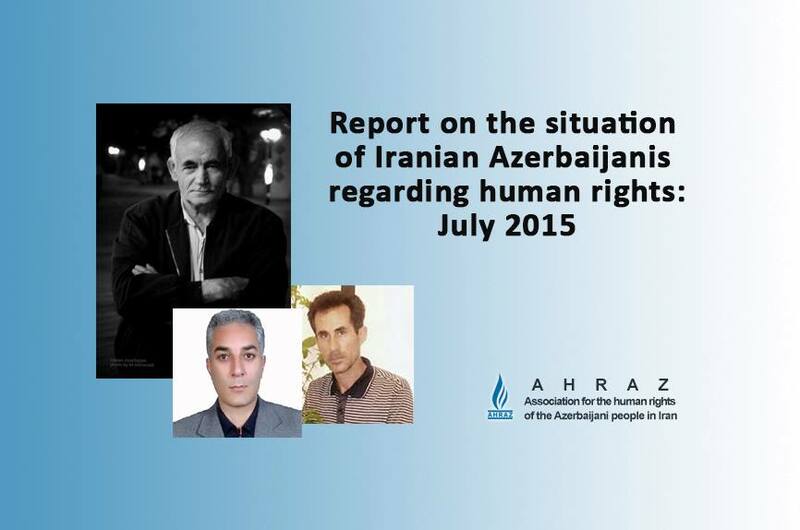 After a while Yones Rahimi, Habib Sasanian and Esmail Afkhami had been transferred to Tabriz Central Prison. Among them Yones Rahimi and Esmail Afkhami have been released recently. However the fate of other detainees is not clear so far. It is said the families of the detainees are under pressure not to speak to the media. All of them were active in protesting against Iranian government to stop supporting Armenia in the conflict between Armenia and Republic of Azerbaijan. 25 Bahai-run business have been closed down by authorities in Urmia. According to BahaiNews website, during two week in May and June 2016 the Public Places Office have shut-down more than 28 Baha’i-owned businesses in the city of Urmia, the Azerbaijani city in northwest Iran. In the past few years, the Public Place Office has sealed many Baha’i-owned businesses. It is supposed that the reason behind the shut-down of the Baha’i-owned businesses to be because of opposition of the Intelligence Ministry to Baha’i companies closing on the nine Baha’i religious holidays. 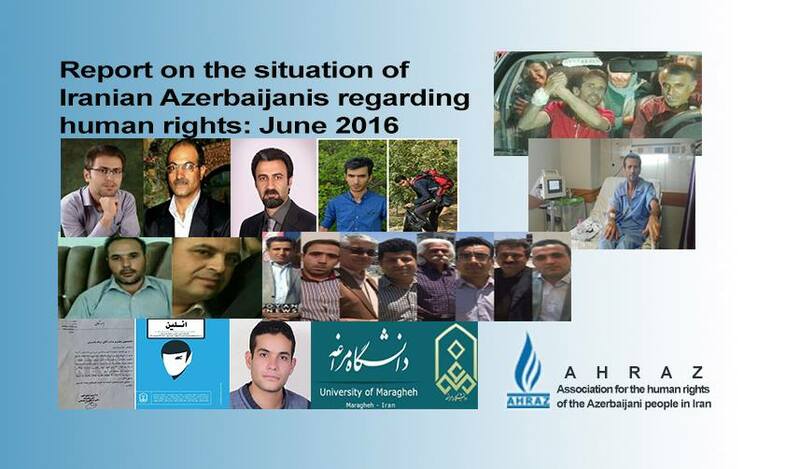 On 16 June 2016, the court session of 8 civil rights activists in the city of Baharestan was held by the judge Mr. Hasani, Head of the judiciary office in the city. Akbar Azad, Alireza Farshi, Behnam Shaikhi, Hamid Manafi Nazarloo, Rostam Kazampoor, Mansour Fathi, Aziz Farshi and Mahmoud Ojaghlou are the Iranian Turk activists who had participated in the court session. They had been arrested in Feburary 2014, in connection with the ceremony of The International Mother Tongue Day in the city of Nasim Shar near Tehran. They all had been transferred to the prison of Evin at which been kept for several months. The accusation against the activists has been ““participation in illegal gatherings against national security”. On 16 June 2016, Behboud Golizadeh, one of the most prominent Iranian Turk activist was released on parole after 40 month imprisonment in Tabriz Central Prison. It needs to be mentioned that Mr Gholizadeh along with other four members of the Board of Directors of Yeni GAMOH Party were sentenced to 9 years in prison in June 2013 by the rovelutionary court of Tabriz. 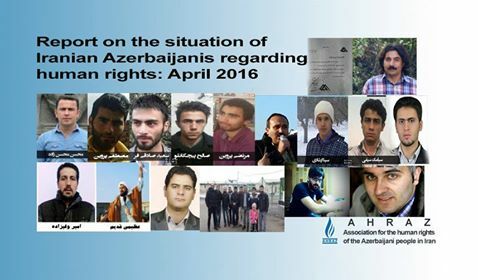 The prominenet activists, Latif Hassani, Mahmoud Fazli, Shahram Radmehr, Ayat Mehr Ali Bayglu and Behboud Gholi Zade had been arrested on the charge of forming an illegal group, the New Southern Azerbaijan National Awakening Movement Party (Yeni GAMOH), and distributing anti-government propaganda in February 2013. Before, Mr. Mahmoud Fazli had also been released as conditional freedom in November 2015. The parole for the other prisoners of Yeni Gamoh founders has been rejected several times so far. After release of the ninth issue of a student magazine called “Elin” in the spring of 2015, the supervising committee over publications at the University of Maraghe City ordered suspension of “Elin” magazine for a year. This committee summoned Milad Balsini, the director responsible for the magazine. Milad Balsini the former director of this magazine told to Oyan News that the authorities of Maraghe University intended to cancel licence for the publication of this magazine through unjustified excuses. Following suspension of the above-mentioned magazine, the disciplinary committee of the Maraghe University condemned Milad Balsini to reprimand and formal filing of the case as well as temporary suspension from education for half a year. This Quarterly student magazine was publishedin to two languages of Azerbaijani Turkic and Farsi, which was directed by Milad Balsini, a member of Azerbaijan-ology Club at the Maraghe University since four years. In recent days and after that Rasoul Razavi has ended hunger strike to be prepared for legal proceedings, a court session was held in the general court of Tabriz city under strong security considerations. Rasoul Razavi had started a hunger strike since 19 May 2016. This civil rights activist was detained in Tabriz city on 12 November 2015 during massive anti-racist demonstrations in the Azerbaijani region of Iran. On 29 June 2016, Rahim Zareei, civil rights activist from Tabriz city was released after four-day detention in the Tabriz Intelligence Department. His father`s house was also searched by the security forces and so his private belongings such as his computer, notes and telephones became confiscated. Before his arrest, security forces had asked him many times through telephone calls to go to the Tabriz Intelligence department, but he had refused to do so and had asked for the delivery of formal court order. Jafar Azimzadeh imprisoned labor activist who was released on furlough after 64 days of hunger strike was hospitalized in Ateyeh hospital due to his critical condition. Jafar Azimzadeh who was released on furlough due to authorities’ promised for a retrial after 64 days of hunger strike was hospitalized in Ateyeh hospital due to his critical health condition. On 1 July 2016, by on-going intestinal bleeding he also suffered serious stomach problems and his doctor announced that by continuing the hunger strike he would go into coma and there was also the risk of death. 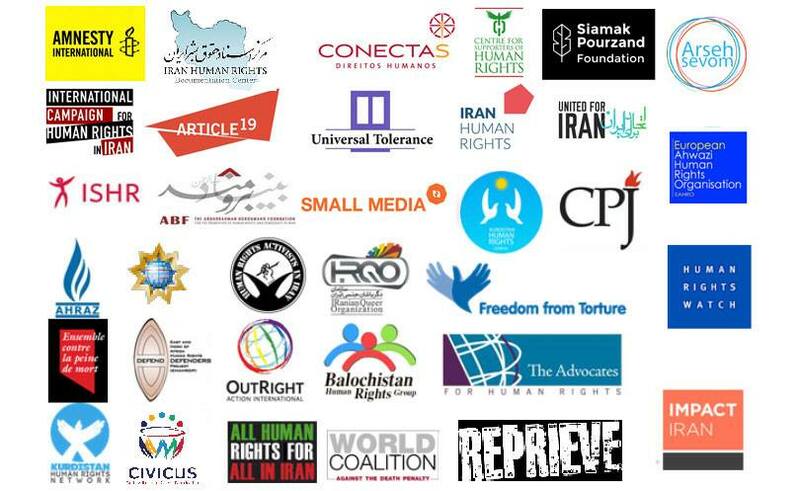 Jafar Azimzadeh was sentenced to six years imprisonment and two years deprivation of ‘activities in cyberspace and the media and the press’ by the Revolutionary Court in 2015. The labor activist was one of coordinators of scroll of the petition signed by forty thousand workers to increase the minimum income. He has been sentenced to six years in total on charges of gathering and colluding with intention to act against the national security, disturbing public order and propaganda against the regime. Salvati, judge of branch 15 of Tehran Revolutionary Court, has not accumulated the labor activist’s time under detention in the verdict. Azimzadeh’s charges were, the formation of the Free Union of Iranian Workers, the formation of the National Union of Dismissed and Unemployed Workers in cooperation with the Committee of Labor Unions, gathering in Laleh Park in 2009 at the International Workers’ Day, guiding the labors in a protest in 2005, constituting, planning and management of workers’ protests in 2014. Azimzadeh also has been sentenced because of gathering signatures for the petition of forty thousand workers and protest in front of Parliament and the Ministry of Labor, protesting against the approved basic income, being the representative of thousands of workers against Saeed Mortazavi, protesting against the changes in labor law, meeting with other independent workers’ organizations such as Syndicate of Workers of Tehran and Suburbs Bus Company, Syndicate of Workers of Neishekar, the Coordinating Committee and interviews with some overseas media. Jafar Azimzadeh was arrested on the eve of May Day in 2014 in Tehran by security agents and after 46 days was released from Evin prison on a bail of 1 billion IRR. On November 8, 2015 according to the warrant of Branch 1 of Enforcement Criminal Court for the District 33 of Evin, for serving his sentence he showed up at prosecutor’s office in Evin prison and was transferred to ward eight. Jafar Azimzadeh, jailed trade unionist was sent to furlough by end of his hunger strike and promised an investigation into the case, after 64 days of hunger strike on June 30. Probably the labor activist will be admitted in another hospital due to his physical condition’s deterioration by his family’s decision. Jafar Azimzadeh ended his hunger strike at 8 PM on Thursday, June 30, 2016, by adopting a retrial and impartial investigation of the case and extendable furlough and was released from the hospital by family. The labor activist was one of the coordinators of the petition signed by forty thousand workers to increase the basic income. He has been sentenced to six years in total on charges of gathering and colluding with intention of acting against the national security, disturbing public order and propaganda against the regime. Azimzadeh’s charges were formation of the Free Union of Iranian Workers, formation of the National Union of Dismissed and Unemployed Workers in cooperation with the Committee of Labor Unions, gathering in Laleh Park in 2009 at the International Workers’ Day, guiding the labors in a protest in 2005, constituting, planning and management of workers’ protests in 2014. On November 8, 2015 according to the statement of Branch 1 of Enforcement Criminal Court for District 33 of Evin, for serving his sentence he introduced himself to prosecutor’s office in Evin prison and was transferred to ward eight. On June 29, Jafar Azimzadeh’s relatives and colleagues held a rally in support of the imprisoned worker who had spent 64 days on hunger strike in front of the President’s Office (Pasteur St). According to the report of Human Rights Activists News Agency (HRANA), following the recall on June 28, Jafar Azimzadeh’s relatives and colleagues held a rally in support of the imprisoned worker who had spent 64 days on hunger strike in front of the President’s Office on June 29. At the rally, the demonstrators chanted slogans such as “Workers should not be in prison, Jafar Azim Zadeh at risk, every time a disaster”. According to one participant, the continued presence of demonstrators increased the security atmosphere and the commander of the police called them to disperse. Ms. Mohammadi and Ms. Azim Zadeh expressed the demonstrators’ demands as their delegates, finally. The delegates gathered in front of Presidential building and negotiated with the authorities. It is worth noting that the participants at the rally then went to Sina hospital to visit Jafar Azimzadeh and peacefully left the hospital by the opposition of security officers and request of Ms. Azimzadeh. Abbas Jafari Dowlatabadi, Tehran’s prosecutor after accepting to meet the wife of Jafar Azimzadeh, secretary of the board of the Free Trade Union of Workers in Iran imprisoned at Evin Prison on 59th day of hunger strike, told her that he would do nothing for her husband even if he dies, yesterday. Jafar Azimzadeh, imprisoned labor activist at ward 8 of Evin prison has been recently kept at Sina Hospital in Tehran following the deterioration of his health condition. He is on the 60th day of hunger strike protesting “suppression labor and teacher activists through security charges”. “Mr. Azimzadeh’s wife went to meet Mr. Jafari Dowlatabadi to follow the case of her husband and his demands. But Mr. Dowlatabadi told her with anger that he would do nothing for him, even if he would die. He is responsible for it and it’s no one’s business.” A source close to Jafar Azimzadeh told HRANA, yesterday. The labor activist was one of coordinators of scroll of the petition signed by forty thousand workers to increase the basic income. He has been sentenced to six years in total on charges of gathering and colluding with intention of acting against the national security, disturbing public order and propaganda against the regime. On November 8, 2015 he was summoned to Evin Prison to serve his sentence.